At flipkart.com you can purchase WWE 2K17(for PS4) for only Rs. 880, which is 65% less than the cost in Tatacliq (Rs. 2,499). The lowest price of WWE 2K17 for PlayStation 4 was obtained on April 24, 2019 9:28 pm. Experience the most authentic WWE gameplay ever, featuring thousands of new moves and animations, backstage and in-arena brawling, and the biggest roster of WWE and NXT Superstars and Legends to date. Now more than ever, you will feel like you are commanding an actual WWE broadcast! Create and develop your custom WWE with the deepest Creation Suite to date, featuring new creation options such as Create a Video and Create a Victory. New features and additional content allow you to create the most amazing custom Superstars, Arenas, and Championships. The power is in your hands to create your WWE! The all-new Promo Engine brings the drama and personality of the WWE Superstars to life in MyCAREER and WWE Universe modes. Choose your words wisely and smack talk your opponents, start rivalries or form alliances. Your words will shape your characters as they rise through the ranks of NXT and WWE, to become WWE Hall of Famers! Enjoy a star-studded soundtrack featuring the top names in the music industry, curated by Executive Soundtrack Producer Sean “Diddy” Combs aka “Puff Daddy”! Are you ever planning to upgrade your graphics? LIKE EVER? This series has had literally the same old cartoon graphics since it started. Clearly they don’t give a damn about what they’re making, they’re doing it because they know people will buy it. Don’t go for it. Please. I have played all WWE 2K games except 2K15 on the PS3 and the PS4. This review is my opinion of how the three games mentioned in the title fare against one another.RosterI know WWE2K16 has the largest, but in terms of quality and variety (Yokozuna, Hulk Hogan, etc., missing in the other two), I’d give the edge to WWE 2K14! I am not sure if others will agree, but I find character likeness to be better overall on PS3 the on the PS4. I had similar impressions with Don Bradman Cricket 17. DBC 14’s model of Bradman model looks much more like his real-world counterpart on the PS3 version. 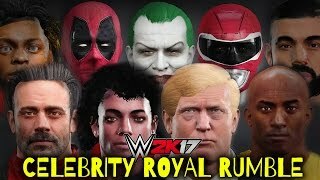 I know you can download community created characters, but I do not find it the same thing as they are often lacking their music, movies, commentary, etc.FeaturesNo showcase mode in 2K17, so I’d place it last. 2K14, with its Wrestlemania mode, is the winner for me.Creation modeI find it really frustrating that 2K has scaled back certain very useful things while improving the others. I like than you can upload and use a photograph of your face in 2K16 (app not relesed yet for 2K17), but 2K14 had tons of useful features and pros (the “pagri” headgear being my pesonal favourite — it allowed me to create crazy characters like Chacha Choudhury) that were removed. Also, in 2K14 you could create the name announcement in two or more separate parts, allowing much more variety. 2K17 even restricts you in terms of what you can have as in-ring attire (e.g., certain headgear is not allowed). Even though the online/community features are retired, I keep going back to 2K14 to create characters.GameplayI think WWE 2K17 has the edge here, albeit marginally.The fighting-in-the crowd feature sounds exciting, but I found it to be a bit of a damp squib as you have limited moves at your disposal and it gets stale pretty fast.